Tópico em 'Tempo Tropical' iniciado por Vince 12 Nov 2007 às 23:35. Tópico de seguimento da época ciclónica Pacífico Sul, a leste de 160°E. Há duas entidades responsáveis pelos alertas e vigilância nesta região. The weather office in Nadi is warning of heavy rain and flashflooding over the next few days as a result of the proximity of Cyclone Daman. 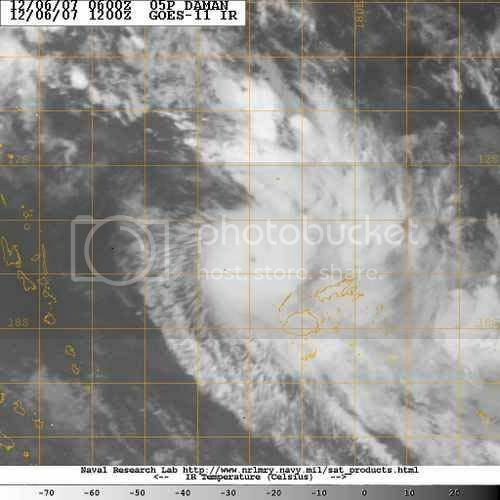 At 2pm yesterday, Daman, the first cyclone for the 2007-2008 season, had developed 85 kilometres east northeast of Rotuma. At 4.15pm, Cyclone Daman had gale force winds averaging 75km/hr close to its center. 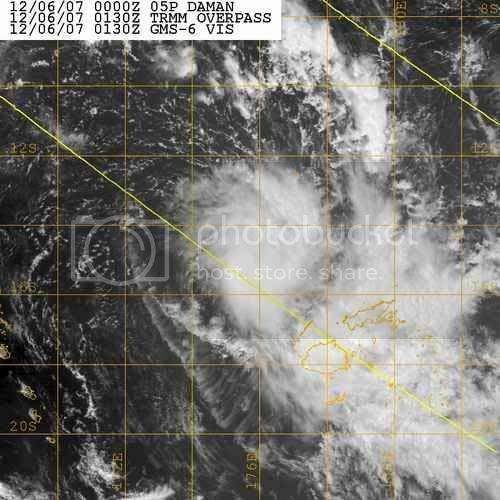 It was expected to pass over Rotuma last night and then curve south towards Vanua Levu, Taveuni and later move to Lau. At 9pm, Cyclone Daman changed direction and headed away from Fiji, but the Meteorological Office says a storm warning is in place for the Fiji group as a result of the proximity of the cyclone. Director of Meteorology Rajendra Prasad said the country should expect strong winds, heavy rain and, as a result, flash flooding. Last night, the Fiji Navy had a team on standby and was monitoring the weather and the current path of the cyclone. "We have special procedures to be followed when this kind of warning is issued and we are monitoring the situation," an officer at the operations centre said. Last night, District Officer Rotuma Nicholas Ting said they were told of the warning yesterday afternoon but the wind was "not that strong". "At the moment we are monitoring the situation ... if the situation worsens, then we will have to activate our evacuation centres," he said. Rabi Police Station officer Corporal Taam Gill said they were monitoring the situation last night after receiving a warning. Commissioner Northern Samuela Sadranu said he had not received any official warning but was monitoring the situation from radio broadcasts. Consort Shipping Line Ltd Operations Manager Oliver Smith said they were not aware of any cyclone warning last night. "Our shipping schedule has not changed and one of our ships left yesterday (Wednesday) morning and the next one is to leave on Friday," he said. The shipping line services the northern sea route. Suilven Shipping CEO Sitiveni Rabuka said their captain was aware of the weather system and their ships were equipped with weather tracking equipment, so they would have the latest satelite data. "Furthermore, the ships and crew have Standard Operating Procedures to guide their response or other actions in adverse weather conditions," said Mr Rabuka. "Of paramount importance in our Ships Operating Manuals is the safety of the ship and all on board." DISMAC director Joe Rokovada was out of the office on bereavement leave. Interim Transport and Works Minister Manu Korovulavula said he was aware of the cyclone alert but had not received an update last night. Meanwhile, the areas affected by flashfloods in Rakiraki on Tuesday cleared after rain eased later on Tuesday night. Rakiraki Provincial Administrator, Josefa Kama said all roads was cleared of flooding and the Raiwasa Bridge had been reopened to traffic. Mr Kama said the authorities were now concentrating on cleaning the debris brought up by the flash floods. Meanwhile, cyclones in the Pacific are named according to a schedule of names prepared by the World Metrological Organisation when it meets every two years. Director of Meteorological Services Rajendra Prasad said the organisation meets every two years and there is a list set up for weather meteorological services to look once there is a cyclone. "The book contains the characteristics of assessing the force of wind to decide if it is a cyclone and then a name is chosen," he said. He said the name is selected in alphabetical order. "We are mostly responsible for the naming of the cyclones in the Pacific and the last one that we named was Cyclone Cliff," he said. The next cyclone would be named Elisa. Deve ser a data local. O dia muda na linha internacional da data, mais ou menos nos 180º. Pela diferença horária lá já é dia 6 de Dezembro. Está já a desenvolver o olho. SEVERE Tropical Cyclone Daman, gusting up to 275km per hour at its centre, is set on a course to batter northern and eastern parts of Fiji tonight and is expected to bring strong winds to Tonga tomorrow. The Cyclone is a Category 4 storm with very destructive hurricane force winds at its centre that is expected to track across Labasa and Taveuni tonight before curving south, according to the Nadi Tropical Cyclone Warning Centre. A strong wind warning remains in force for all Tonga waters. Tonga - The latest weather bulletin issued by the Tonga National Weather Forecaster, at Fua'amotu at 7:00 pm tonight, Friday 7 December, stated that Tropical Cyclone Damon was located near 150km northwest of Labasa, Fiji, at about 4 pm today and is moving east at about 18km/hour but is expected to curve more southeast tonight. Close to its centre wind speeds are estimated to average around 195km/hour with momentary gusts up to 275km/hour. An associated trough of low pressure affects Tonga, meanwhile a ridge of high pressure extends on to the group from the southeast. The forecast to midnight tomorrow, Saturday, for Tonga is for moderate to fresh east to northeast winds, cloudy with occasional rain heavy at times and a few isolate thunderstorms about the Niuas and Vava'u gradually spreading to the rest of Tonga later tomorrow. Outlook for Sunday is mostly cloudy with rain heavy at times likely over most places. A strong wind warning remains in force for all Tonga waters. The mean sea level pressure at 7:00 pm was 1012.0HPA. Fiji - Meanwhile, according to local residents Suva experienced heavy rainfall this afternoon as the cyclone approached Labasa to the north, while Nadi had strong showers with river flooding causing difficult driving conditions between the Suva and Nadi. This morning the Fiji Department of Meteorology stated that Daman poses a more direct threat to the Northern and Eastern Divisions of Fiji. "The system may make landfall between Labasa and Udu Point tonight or early tomorrow but this could change as the system has demonstrated a very unreliable track so far," Rajendra Prasad the Fiji Director of Meteorology stated. "Destructive storm force winds extend to about 70 km from the centre and damaging gales to about 160 km from the centre. The system may maintain this intensify for at least 12 hours as it follows a more east-southeast path for a while before curving southeast." A Category 4 storm, Daman has triggered a hurricane warning for some of Fiji's larger islands, including Cikobia and northeastern Vanua Levu. Daman's eye is expected to brush Vanua Levu, which is Fiji's second largest island, said meteorologist Alipate Waqaicelua. The storm is predicted to bring "winds of very destructive hurricane force" within 30 miles (48 kilometers) of its center, according to the Fiji Meteorological Service. The island's Nadi Meteorological Center warned that the storm will "cause major flooding" and "pretty serious damage" to islanders' flimsy housing. Estimated average winds speeds near Daman's center are up to 112 mph (180 kmh) gusting to 161 mph (260 kmh), according to the Fiji Meteorological Service. "Expect heavy rain and squally thunderstorms, especially over the eastern half of the country," said the service's Web site, which also warned of flash flooding in low-lying areas, rivers and streams. O ciclone Daman ganhou força e alcançou a categoria 4 nesta sexta-feira, causando a formação de ventos de mais de 200 km/h, enquanto se aproxima das ilhas Fiji, no Pacífico. Daman deve atingir Vanua Levu --a segunda maior ilha do arquipélago, com 360 mil habitantes-- neste sábado. A população local começou a ser retirada ou a proteger suas casas em todo o país. Trabalhadores de hotel preparam paredes para a chegada do Daman em Fiji; ciclone ganha intensidade ao se aproximar do país. Segundo o diretor do Centro de Meteorologia de Fiji, Rajendra Prasad, Daman ganhou intensidade e está apenas "uma categoria abaixo de se tornar um super ciclone". "Ele se move em ritmo lento, e ainda pode ganhar mais força", disse Prasad. A mídia local alertou os moradores contra os ventos destrutivos de Daman nesta sexta-feira. "Um alerta para todos que nos ouvem, o ciclone Daman muda de trajeto com rapidez e ganha força em direção a Vanua Levu. Tomem precauções já", informou uma rádio local. Companhias aéreas que operam em Fiji cancelaram parte dos vôos domésticos e internacionais. "Muitos estão comprando mantimentos e comida enlatada para se prepararem para a chegada do ciclone", disse o morador Sanjeet Maharaj em Rkiraki, na costa norte. Os fortes causados por Daman arrastaram um navio de passageiros contra um recife próximo da ilha de Rotuma, ao noroeste de Fiji, na noite da última quarta-feira (5). "O navio está encalhado no recife, e ainda tentamos retirá-lo", informou Josefa Tuamoto, da companhia Blue Lagoon Cruises. Os 12 tripulantes foram salvos e não sofreram ferimentos. O governo australiano divulgou um comunicado, pedindo que seus cidadãos que estejam em férias em Fiji procurem abrigos do governo e entrem em contato com familiares na Austrália. "Em algumas áreas, há abrigos adequados para um ciclone severo, para aqueles que escolherem ficar. Sigam os planos de retirada dos hotéis ou navios", diz a nota oficial. O comunicado adverte ainda os australianos a manterem seus documentos à mão. "Sugerimos também que entrem em contato com familiares e amigos na Austrália". A CYCLONE flattened much of the tiny Fiji island of Cikobia today with most houses and vegetation destroyed, but its 69 villagers survived by hiding in caves. Communications to the remote island on Fiji's north-eastern border were knocked out in the storm but a brief radio telephone message confirmed all villagers had been accounted for. They were able to flee their homes before Cyclone Daman made a direct hit about 3am (2.30am AEDT) and took shelter in caves on the island. The full extent of the damage to Cikobia is unlikely to be known until tomorrow after initial attempts to conduct an aerial survey were aborted because of continuing poor weather. As Daman, packing cyclone-force winds of up to 260 kilometres an hour, bore down on Fiji yesterday, residents were forced to take shelter and tourists were evacuated from expensive resorts on outlying islands. The storm, a category four on a five-point scale, was initially heading for Vanua Levu, Fiji's second largest island, before veering away and making a direct hit on Cikobia.